Reiki, as we know it, came to light in the late 1800s in Japan through a man called Mikao Usui. There have been several books and histories written about Usui's life and works, often with 'facts' that have not withstood careful scrutiny. The life story of Usui as told in Japan is quite different from that generally accepted outside the country. However, the biography of Usui, how Reiki moved beyond the shores of Japan, and the development of the various Reiki factions and so-called authorities in no way alters the essence of the energy and the personal nature of it. We would urge those who are interested in Reiki not to be overly concerned with the history of Usui and how Reiki moved beyond the shores of Japan, but instead to develop their own personal relationship with the energy, as this is what is more important than what anyone says about it. Mount Kurama in northern Kyoto, Japan, is the home of Reiki. According to legend from Kuramadera (Kurama temple), the main Buddhist temple on Mt. Kurama, Mount Kurama was a volcano that rose from the sea about 260 million years ago, and was full of "Reiki of Sonten." Six million years ago, Maou-son, the great king of the conquerors of evil and the spirit, descended to Mount Kurama from the planet Venus with the mission of the salvation of mankind. In A.D. 770, Gantei, the most favored pupil of the high priest Ganjin who had founded the Toushoudaiji Temple in Nara, was led by a white horse to climb up Mount Kurama. He was enlightened with the realization of Bishamon-ten, the protector of the northern quarter of the Buddhist heaven and the spirit of the sun. 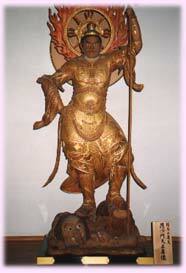 Following this, he established a Buddhist temple on Mount Kurama. 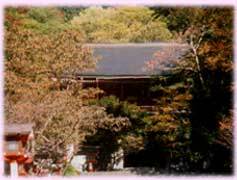 The temple there is now home to the Kurama Koukyou sect of Buddhism. Maou-son, Bishamon-ten and Senju-kannon are symbols of the Universal Soul, forming a trinity known as Sonten or the Supreme Deity. Sonten is the Living Soul, the Supreme Soul of the Universe, the Glorious Light and the Activity of the Soul. 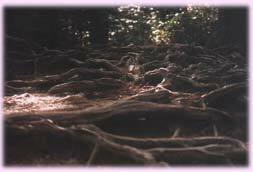 The monks and nuns who live and work at Mount Kurama talk about Sonten Reiki as the spirit of the mountain, the force of nature that surrounds it.